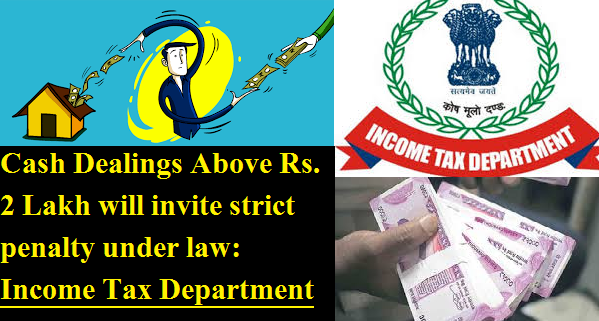 NEW DELHI, 29 August 2017: Again the Income Tax Department warned the people against cash dealings of Rs. 2 lakh and more on Monday , saying any violation of this cap will invite strict penalty under law. In a public message, the department said "accepting Rs. 2 lakh or more in aggregate from a single person in a day for one or more transactions relating to one event or occasion is prohibited". "Similarly, receiving or repaying Rs. 20,000 or more in cash for transfer of immovable property and paying more than Rs. 10,000 in cash relating to expenditure of business or profession is also banned. The central government had banned cash transactions of Rs. 2 lakh or more from April 1, 2017, through the Finance Act 2017. Receiving or repaying Rs. 20,000 or more in cash for transfer of immovable property and paying more than Rs. 10,000 in cash relating to expenditure of business or profession is also banned. Cash transactions of Rs. 2 lakh or more from April 1, 2017, through the Finance Act 2017.